Outside of directing the West Seneca Marching Band (WSMB), John Blickwedehl has been on the teaching staff of the world-class Blue Stars Drum and Bugle Corps since 2014. This past summer while on the road with the corps for three weeks, Blickwedehl learned the Blue Stars were utilizing the Ultimate Drill Book app. He asked his friends on staff about it and they showed him how it was enhancing the corps. After looking into the Ultimate Drill Book app, he decided to set up a trial version of it for WSMB. “We loved it,” Blickwedehl exclaimed. One of the features WSMB members enjoyed was visually being able to see where they should be standing on the field for every single count of their show, not just a count here or there, providing them exact counts of crossing yard lines. Students were also able to learn how their music and movement related because the app animates the drill with the sound file at the same time, allowing them to learn quicker and build confidence. 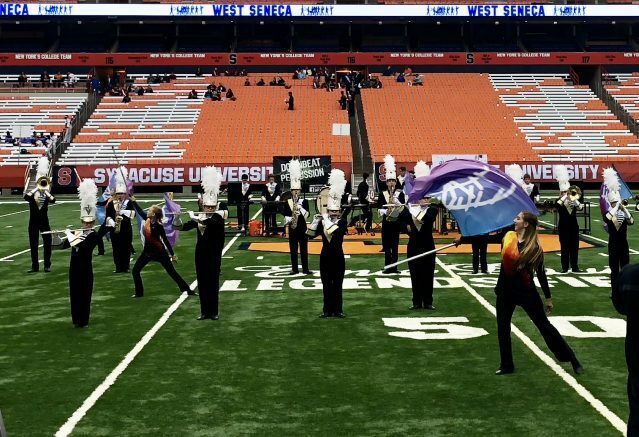 WSMB competed in the New York State Field Band Conference Championship at the Carrier Dome on Sunday, Oct. 28. They placed seventh in their class overall and was scored fifth by both ensemble music judges. It was an impressive show in a very competitive class where placements were decided by tenths of a point. Congratulations to all students and staff on a very successful season! Be the first to comment on "Ultimate Drill Book app helps West Seneca Marching Band learn"